Just one year ago my husband and I were preparing to share the big news with our families. 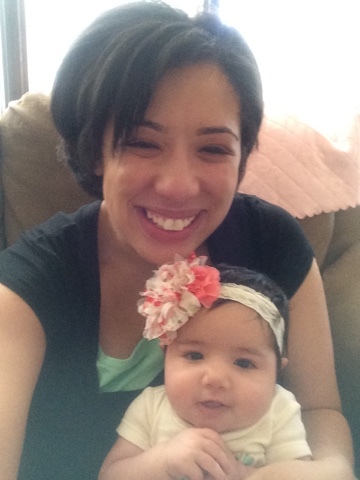 We were excited, nervous, and morning sickness was becoming part of my regular schedule. “Baby J” would be arriving in February… but I had no idea of just how much this little one was going to change our lives. God has revealed His innermost secret: God Himself is an Eternal exchange of love, Father, Son and Holy Spirit, and He has destined us to share in that exchange (CCC 221). I’m sure many different theologians have said something like this, but I will always remember hearing Christopher West talk about how a husband and wife are called to participate in God’s life giving love. This exchange of love is so powerful that nine months later they could be giving that love a name. 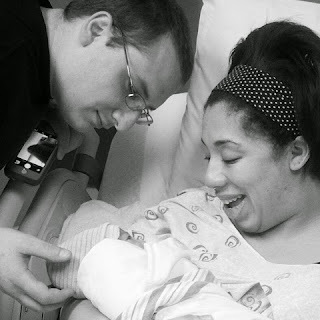 On February 10th at 9:22am, we named that love Alexandria. When Alexandria Elise was held up for me to see and brought to my arms for the first time I was breathless. I don’t know if I will ever be able to adequately put into words the joy and awe of meeting my daughter. 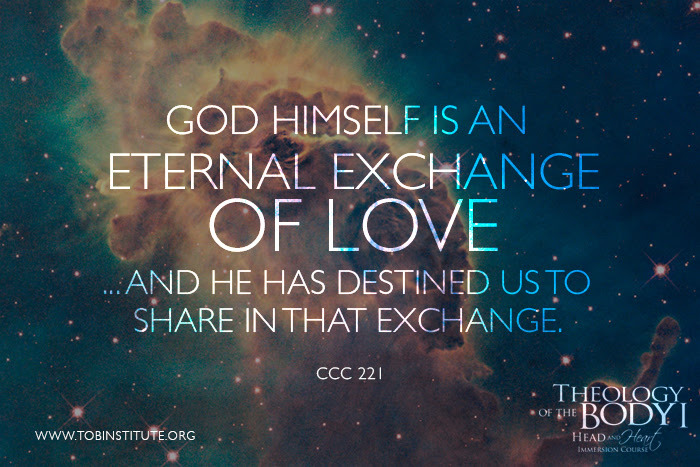 God is an eternal exchange of love…and he has destined us to share in the exchange. And we did! And there she was! She was placed in my arms and we just stared at one another. It was love at first sight. “You were so worth it.” I said, over and over again. 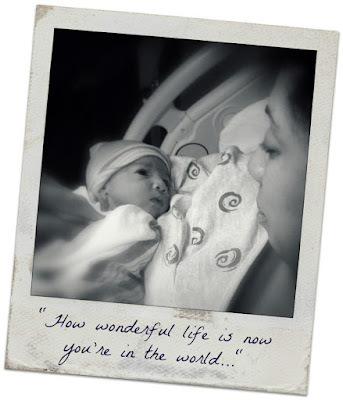 Every pain, every discomfort, the long wait for her arrival, the pain of childbirth… it was all worth it because she was right here. Over the last four months I’ve realized that this is a whole new chapter in the journey. 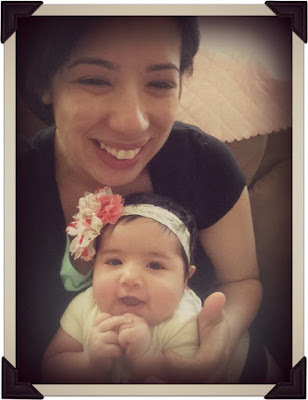 As I continue the daily adventure in motherhood and I know that I still have lots to learn. Life has changed for our family, but in a more wonderful and profound way than I could have ever thought possible. I feel like I’ve grown a lot over the past year. It’s hard for me to imagine what life was like before Alexandria came into our lives. But more than anything I recognize the reality of CCC 221: God has destined us to participate in His life giving love… and I am humbled by and grateful for this vocation of motherhood. This is a new adventure. The call to “get out of the boat” is stronger than ever, and I recognize that in this new adventure, we’re called to trust God with everything, just like He’s always called us to do. 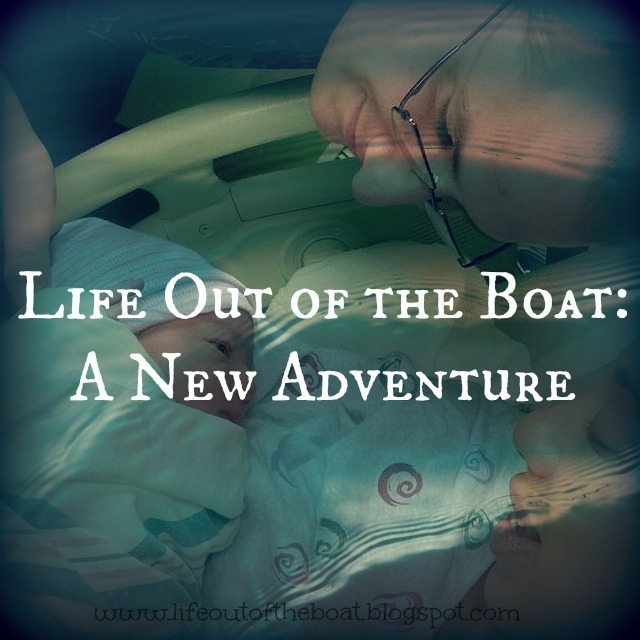 Life out of the boat will be different, more exciting, perhaps even at little scary at times (and I’m not just talking about the blog! ;)). Yet, I already know that it will be 100% worth the effort. God has blessed us with a beautiful, happy, and healthy baby girl and she is a reflection of that “eternal exchange of love” in which God has called us to participate.